The flashy part of Apple's Worldwide Developer Conference (WWDC) ended on Monday, following the company's press conference where iOS 8 and OS X Yosemite were discussed in detail. There are developer sessions and press briefings still ongoing however, and there's a lot of smaller, more granular news coming out of those sessions. USA Today, for example, recently had a chance to check out CarPlay inside of a Chevrolet Spark. As 9to5Mac notes, until now there wasn't any word that Chevrolet had plans to ship new cars with CarPlay pre-installed anytime this year. This doesn't confirm that it will – it could simply be a demonstration by a partner of Apple's – though it certainly suggests that Chevrolet may have changed its plans since CarPlay was first announced. 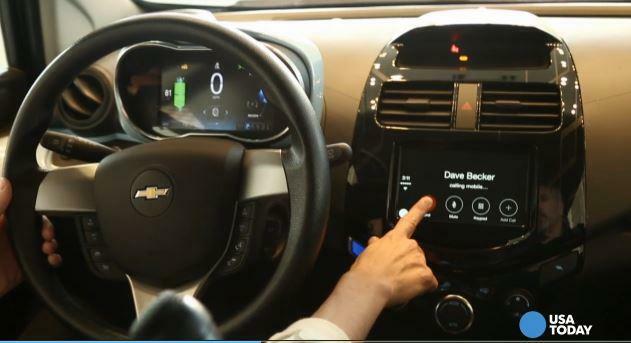 In the demo, we're walked through a lot of the basics that we've already seen like the phone functionality, how to listen to music through iTunes Radio and other music in your library or in the cloud, Apple Maps, Siri and more, though it looks like a custom in-console system built by Chevrolet. If it is, then we might expect Chevrolet to roll out new vehicles in the coming months with CarPlay ready to roll. We'll let you know if the automaker makes any official announcements. Hit the source to see a demonstration from USA Today of CarPlay in the Chevy Spark.